Haha! That's total stephen Right type humor. Awesome!!!! Ha ha! 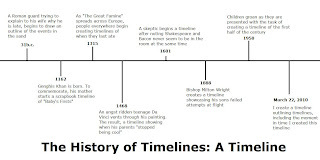 A timeline of timelines! I love it! I'm surprised no one has thought of this before -- next time, a flowchart on flowcharting! I agree. Every point on this timeline is awesomely humorous. Brilliant, TS. I'd love to see thousands more years of it. I have to say thank you. I had no idea until now how far back timeline of timelines went. Love it! Just what we need! Now you have to add every time someone commented on your post about timelines to your timeline pic. This will be a neverending cycle. How clever. That was hilarious. Geof is right, though. This is going to create a never ending cycle of updates. This will be the death of you. But it's okay, because it will of course be recorded on the timeline for posterity. Hands down the funniest thing I have read all week, that just made my morning!